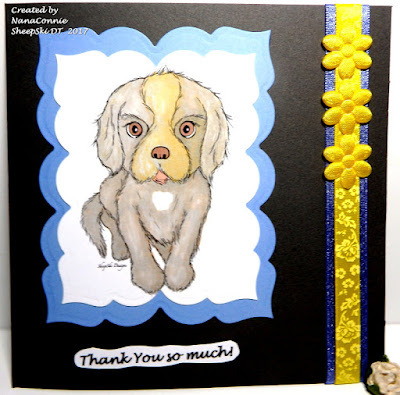 Grammy's Attic: Precious Puppy "Max"
Our latest monthly challenge at SheepSki Designs starts today (along with the other two I've already posted today!) so you're getting a three-fer from me. This is the Sheepski Blog challenge not the one from the Facebook page. That one starts on the 20th of each month so you can play in two SheepSki challenges each month with us. Our theme this month is everyone's favorite, "Anything Goes." I chose this precious little pup, "Max" as the image for my DT card. 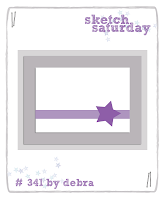 I colored with chalks, then die cut both the image and the mat with dies from Spellbinders. I added two different ribbons, then did three fabric flowers. I'm using this as a card for my local animal shelter. They'll use it as a way of saying thank you to either folks who adopt pets from the shelter or even people who donate funds to cover the expenses incurred taking care of the animals until they are adopted. What a cutie! Love the little puppy AND your card. Adorable puppy and really cute card, NanaConnie. This is gorgeous Connie, I love this cute image. So pretty card! Thanks for playing with us at Di's Digi challenge. Cute! Fabulous coloring with the chalks and those three flowers are the perfect finishing touch! Thanks for playing with Jo's Scrap Shack. REALLY like the colour combo on theis NC, great colouring too. Too cute, brought a big smile to my face, love cards that do that!